Agnes Louise Maxson was born April 9, 1925 to Delbert and Irene (Turner) Barger, in Weston, Oregon. She was raised at the Barger Ranch on Russell Creek. She attended the Maxson Grade School and graduated in 1943 from Walla Walla High School. She met her husband Ken in the first grade and they were married in Visalia, California on the 15th of July, 1944. Ken and Aggie traveled world wide with Kaiser Engineers before returning to Walla Walla, Washington in 1969 to reside at their ranch on Last Chance Road. Chickadee and the brilliant CH Warrick Warrior taking her on her most memorable 'green shaving' rides. 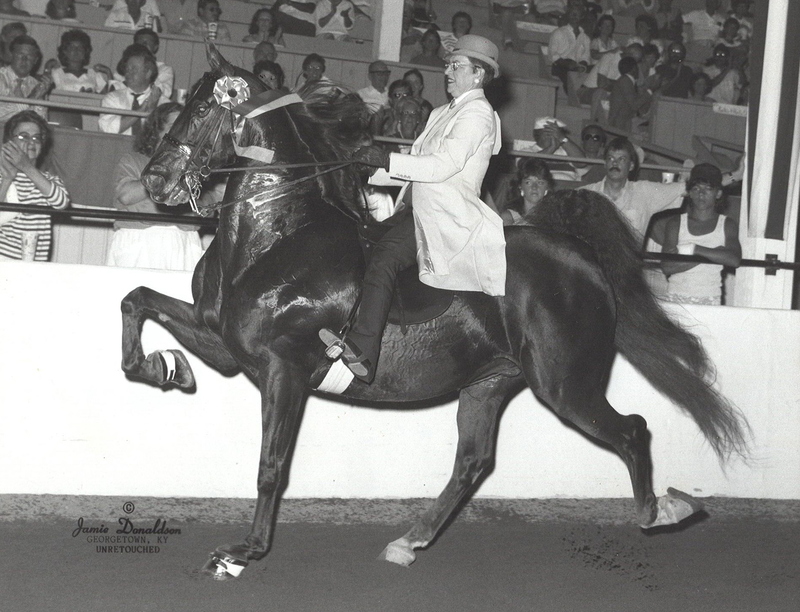 Her time spent training and showing in Kentucky and on the Eastern circuit under trainers Tom Moore and Bill Fields filled her life with cherished memories, along with filling her home with countless championship trophies and awards. Her riding career was brought to an abrupt halt in 1992 after suffering many strokes, but she continued to enjoy the horses as she was able to watch them from her home. Her beloved "Duke" (Coe's Southern Heir) and "Cacho" (Cedar Creek Mr. Cacho Man) spent their days where Aggie was able to watch them from her living room, both staying with her into their thirties. Many happy trail riders at Maxson-Box stables made a pass by the front window for a wave to Aggie. She is survived by her devoted husband Ken; daughter Mickie Maxson-Box and husband Bill, of Walla Walla, Washington; brother Chubb Stampher of Walla Walla, Washington; grandchildren Misty Leber and husband Jim of Denver, Colorado, and Hayden Box of Walla Walla, Washington; and two great-grand babies Trenton and Mathew Leber of Denver, Colorado. She was preceded in death by her parents, Delbert and Irene Barger, and her brother Frances Stampher. Memorial contributions can be made to Faith Bible Fellowship Church Building Fund through Mountain View Funeral Chapel, 1551 Dalles Military Road, Walla Walla, WA 99362.